The average iDevice (iPhone, iPad, iPod Touch) holds a lot of personal information. iPhones probably more than any of the others. The ability to backup your iDevice to iCloud is great and has saved countless people from losing important data. It’s convenient and works without you having to do anything but enable it. I’ve used this feature since day one and enjoyed it but I’ve always kept backups on my Mac as well, after all restoring 30+GB of stuff from iCloud can take hours and bugs/glitches can happen. Then news of PRISM broke and while it was no surprise to see names like Google, Facebook and Yahoo on the list I was shocked to see it’s latest addition was Apple. Learning of what PRISM was for and what it could do I decided to delete all my iDevice backups from iCloud along with other personal information I preferred not to be accessible by those other than Apple. My trust in a company I trusted above all others received quite a blow. Since then I have been backing up and syncing my iDevices as I did two years ago; with a USB cable. I was always a bit hesitant having my iPhone transmitting that much data while it was on my nightstand (familiar with SAR ratings and RF signals impact on the human body?) which is where I charge it and use it as an alarm clock. But it was a very convenient feature so I enabled it. For over a year every bit of my personal and private information was sent to Apple, possibly seen by those with PRISM access and definitely copied in transit by programs like X-Keyscore and other such programs. Nothing I can do about that now, they have it and will do with it as they please but at least they won’t have any of it in the future. Having complete control over my backups feels good and I can trust noone but me will see them. At first I had to remind myself to connect to my Mac whenever I was at my desk but this took only a few days, now a Lightning cable is a permanent part of my setup again along with my Spider. Do I miss the features I disabled? Honestly, not one single bit. It’s faster than iCloud, more private and more secure. If you have forgotten how backing up and syncing was done before iCloud or if you know nothing but iCloud (those new to Apple/iDevice/iCloud), here’s how you can securely and privately backup your iDevice. In the ‘Backups’ section make sure ‘iCloud’ is not checked and ‘This Computer’ is. When selecting ‘This Computer’ iTunes may give you a warning saying your iDevice will no longer be backed up to iCloud, this is fine as that is the main goal of this. When you click the ‘Back Up Now’ button your entire device and it’s contents are saved to your computer and you have once again full control over it. Now about the security part. Check the ‘Encrypt [iDevice] backup’ box and you’ll be prompted for a password, make this long, strong and unique. Do not check the ‘remember password’ box unless you are confident your computer is properly secured (FileVault, disk encryption, firewall etc). With your iDevice backup being protected by a 128-bit encryption and your computer properly secured it’s safe to assume the data is private once again. If you want to verify the backup go to the iTunes Preferences and check the Devices tab. Your backups will show and the encrypted ones display a small lock icon. All that’s left is to delete the backups from the iCloud servers. 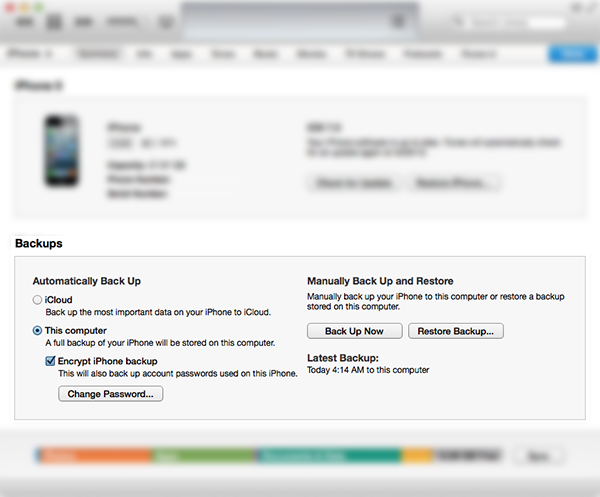 To do this from your iDevice go to Settings > iCloud > Storage & Backup > Manage Storage. Tap on each of your backups and select “Delete”. When all done, turn off iCloud Backups. Make sure each of your iDevices is backed up to your computer before you delete and disable iCloud backups. Now that you are backing up and syncing through USB cable again you might as well disable your Photo Stream too. Importing photos to your computer will go much faster through USB and is of course private and secure. Photo Stream can be disabled on your iDevice in the iCloud settings and in Preferences for iPhoto on your Mac. Syncing photos this way will also give you the option to delete them after import freeing up space. Another added bonus is your backup will be backed up through Time Machine or drive clones as well. Of course if you are doing this for privacy reasons you may want to stop ‘handing out’ your Contacts, Calendars and Documents as well, luckily these can also be synced through USB. Unfortunately iCloud bundles Calendars and Reminders together on OS X. When you disable it you can sync Calendars through iTunes but not your Reminders so if you want your Reminders synced you have no choice but to enable both. Notes require a mailserver to sync so unless you run your own, this too has to be enabled in iCloud. (In the upcoming 10.9 Mavericks Calendars and Reminders each have their own on/off switch for iCloud syncing. So far iTunes does not have the “info” tab which would mean syncing Contacts, Calendars, Reminders etc can no longer be done without iCloud. Will re-test and adjust this post once Mavericks is officially released)(Update: yup, it’s gone). Another small step in getting your privacy back! This is a tough one, I’ll have to think about it.